It was the end of winter and I was shopping at West Elm. On the rack of clearance items was a box of beautiful wood beads. I assumed they were intended as a vase filler but the second I saw the price, I knew these beads had a new life intended for them! 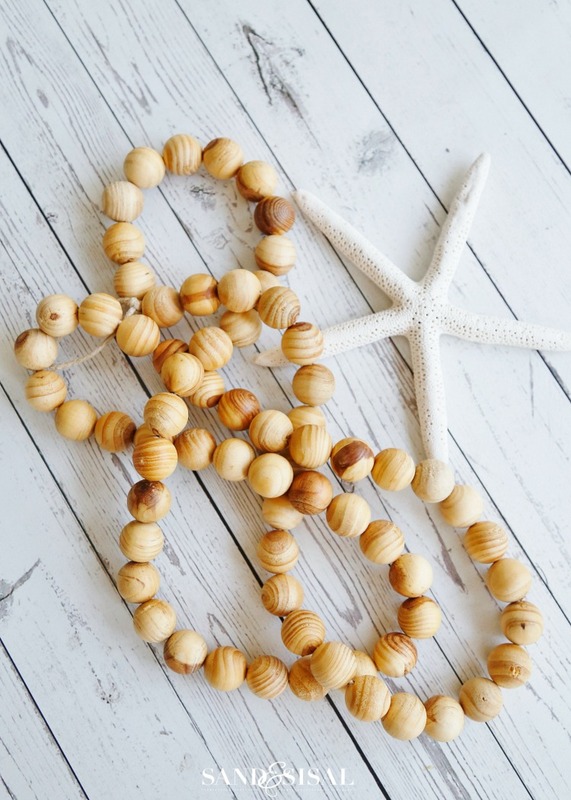 This is a super easy coastal craft – DIY Wood Bead Strand. If you have been following any design magazines carefully then you have seen wood bead strands everywhere. 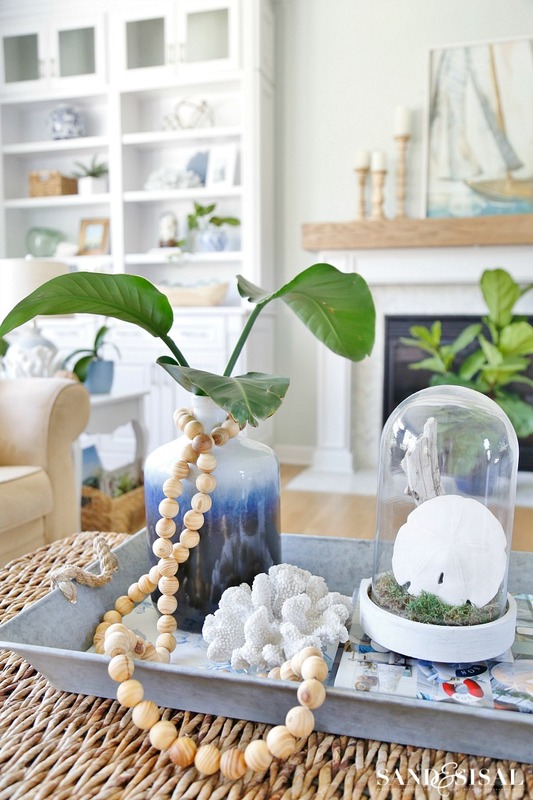 The bohemian style is so hot right now and it blends itself beautifully into coastal design. Buying wood bead strands from retail can be pricey but they can be made so affordably. 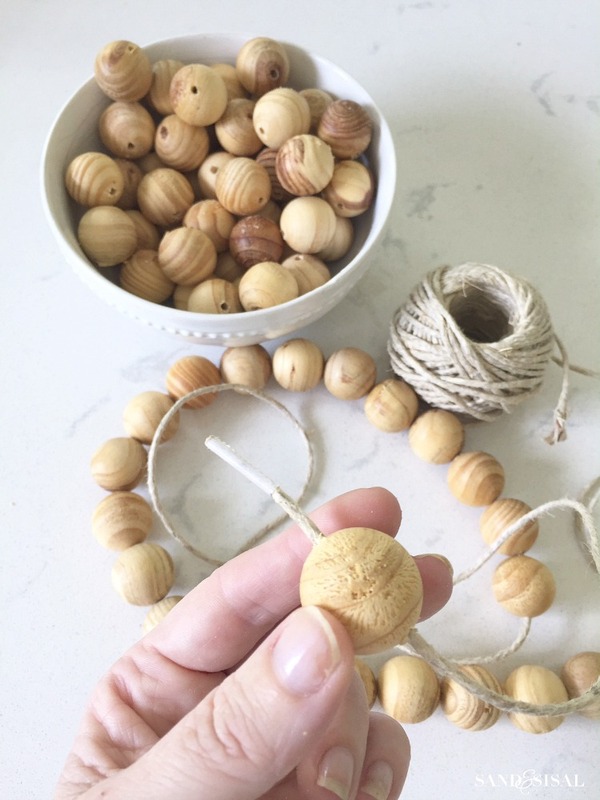 Today I’m going to show you how to make your own and I’m sharing links to where you can buy beautiful wood beads on the cheap! 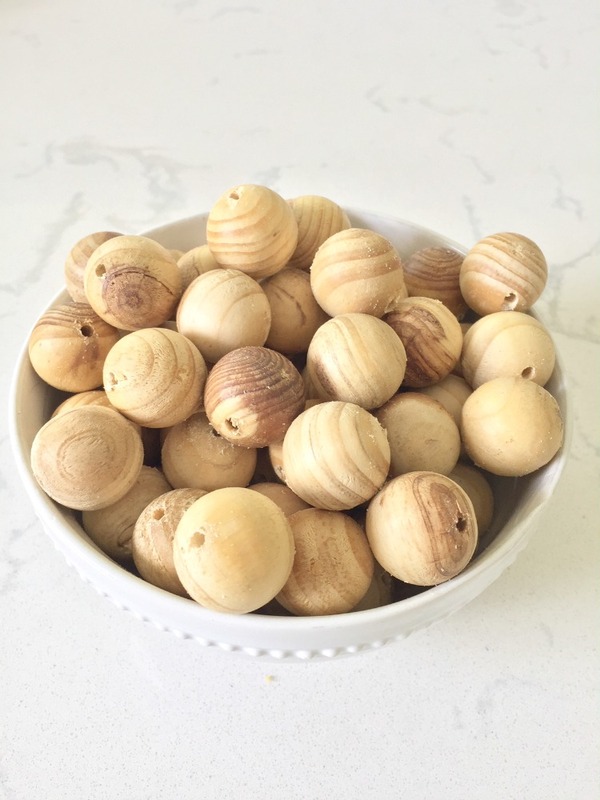 Like I said, I bought by wood beads from West Elm. They did not come with holes drilled in them. Each bead was 1 inch wide. The drill bit I used was a 1/8″ drill bit. This size will accommodate most sisal twine, hemp twine, or leather cords. 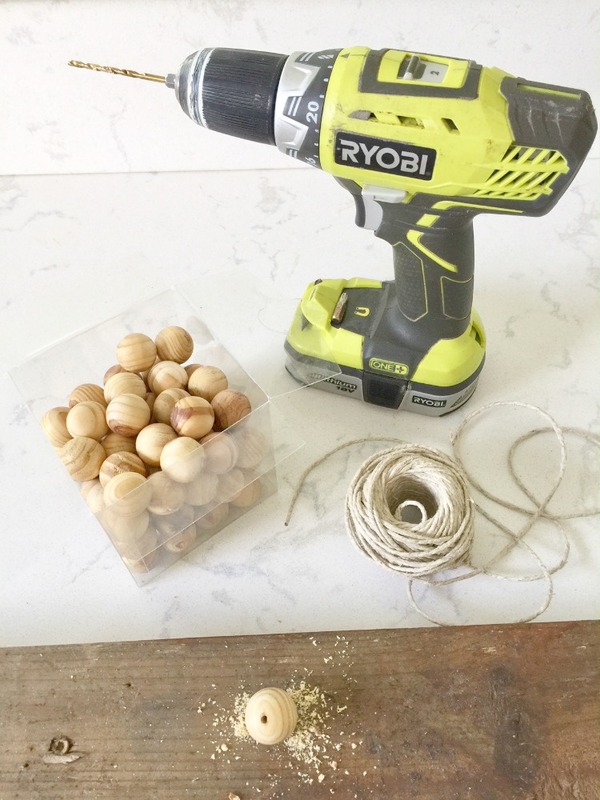 To drill the wood beads, I first placed a thick 2×4 wood plank on the counter and then held each wood bead firmly with my fingers as I drilled. If you are not secure in your drilling skills then I recommend using pliers to hold the bead secure while drilling. Tip: I found that drilling into darker wood was easier than the lighter wood. For this strand, I am using stiff jute string. To ensure easy threading of the beads, wrap a piece of tape around the end of your sisal, juste, or hemp string. 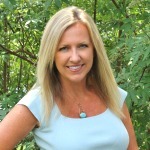 This isn’t rocket science….I call it creative blissfullness…. 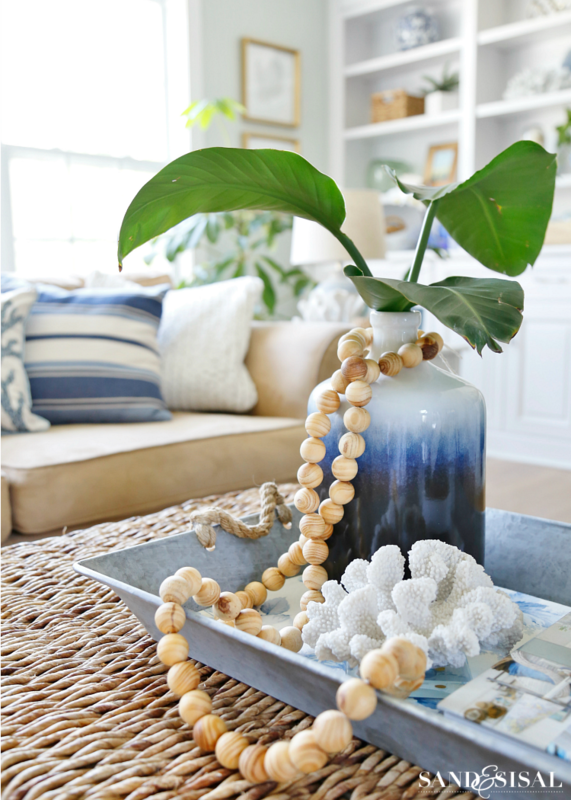 put on your favorite TV show, pour a glass of wine or your favorite beverage and start stringing some pretty beads. The length is is up to you! For my wood bead strand, I used 70, 1 inch beads. Tie each end off with knots or tie together. Add tassels if you desire too! You can use a combination of large and small beads in your bead strand. 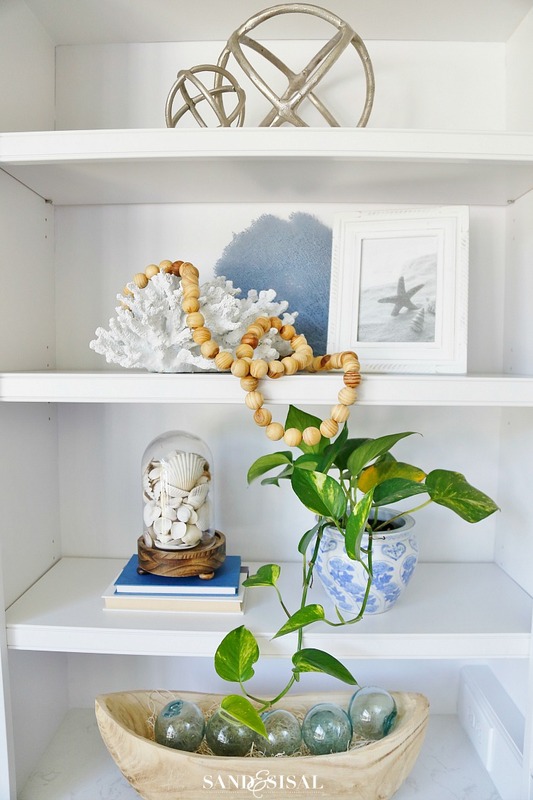 Look for fun and creative ways to display your new wood bead strands. Drape the bead strand over beautiful coral or a stack of books and allow the beads to spill over the edges. 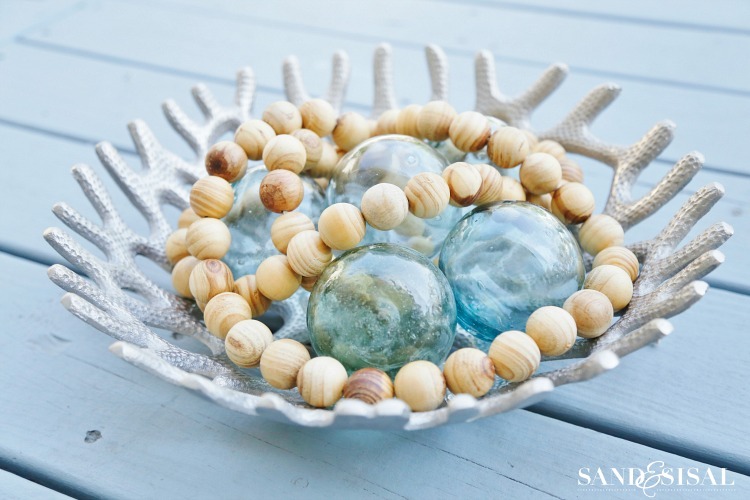 Toss the wood bead strand in a decorative bowl with glass floats for a quick and casual coastal decorating idea. Twist the wood bead strand around the neck of a bottle or vase. I’ll be adding more wood bead strand styling ideas soon! I love coastal crafts. I’ve made quite a few of yours. I have to say, I gasped when you put that 2×4 wood plank on your gorgeous counter! Thanks for the styling ideas! Guess I need to go shopping now for some pretty beads!